Due to typhoon Mangkhut these two sessions have been rescheduled to September 21 and 25 respectively. Just next door in Macau... Five evenings of mesmerizing fireworks and music extravaganzas!!! Two teams participate each evening, each evening features a different theme and the fireworks display sessions last approximately 10 to 15 minutes. The first at 9:00 pm and the second at 9:40 pm. So who's competing this year? 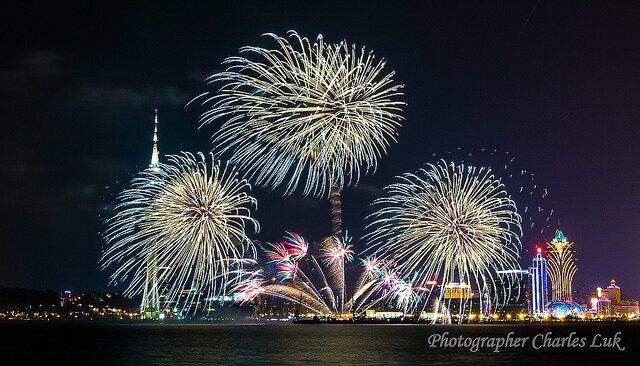 This year will feature ten teams in competition from the Philippines, Korea, Japan, Belgium, France, Portugal, Germany, Austria, Italy and China, of which fireworks companies from Korea, Belgium, France and China will debut in Macau. * These two sessions have been rescheduled after damage caused by typhoon Mangkhut made it impossible to hold the September 15 show and due to the proximity of the two fireworks evenings, more time is required for the pertinent logistic and technical arrangements and the September 24 show has been moved to September 25. Where? 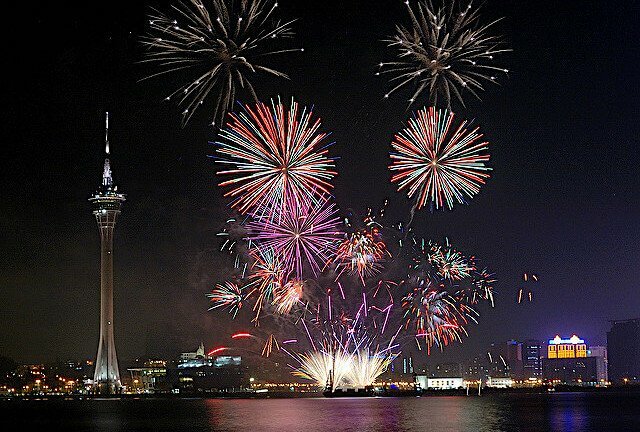 : Fireworks will launch from the sea area in front of the Macau Tower. 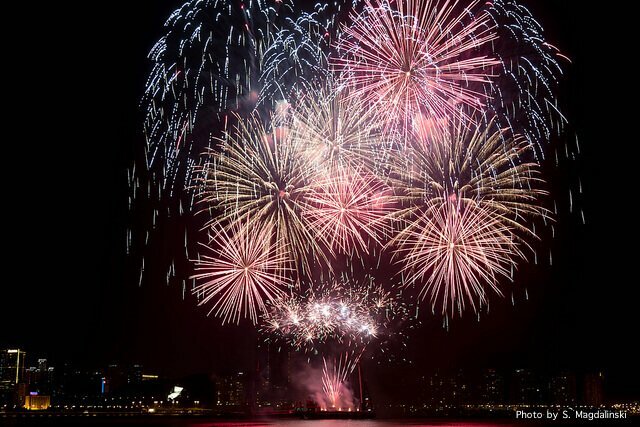 A Fireworks Carnival will be held every fireworks evening next to the Macau Tower from 5:00 pm to 11:00 pm. There will be cultural performances and games and of course, fantastic carnival food! The fireworks will also be broadcast live on TDM - Macao TV Channel. The synchronized music will be streamed on FM100.7 from TDM - Radio Macao's Chinese Channel. Where To Watch the Fireworks in Macau? Where to watch? Just about anywhere in Macau, preferably where the Macau Tower is in full view as this is the focal point of the fireworks. The barges are set up on the bay in front of the Macau Tower. Naturally, watching from the Macau Tower itself will also offer some spectacular views, either from the top or around the base. There are also plenty of FREE viewing spots, needless to say, these places will be crowded and you should come early to be sure to get a good spot! And there is no shortage of cafes and restaurants with that million dollar view, as well as rooftop bars and for the ultimate splurge, watch the show from the comfort of your hotel room with views of the stunning fireworks! These hotels are top picks to watch the fireworks. If you want to watch from the comfort of your own room, be sure to book a room at one of the higher floors with bayfront views. 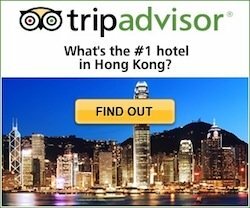 All of these hotels will also have restaurants, lounges or rooftop bars from which to comfortably watch while enjoying a cocktail or a nice dinner from a relatively uncrowded space. Standing at 338m high right at the edge of the peninsula, this is the centerpiece of a massive entertainment and restaurant complex and fireworks "grand central". 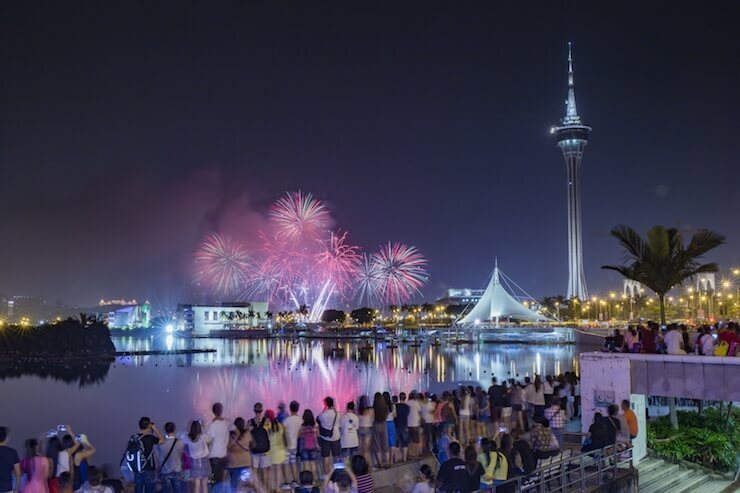 During the fireworks contest, the area surrounding the Macau Tower is enveloped in a carnival atmosphere, with lots of activities being planned for festival nights. From the Macau Tower all along the shoreline you can catch some great views. Two popular areas are around the Kum Ian Statue park and the Macao Science Center. The 20 meter tall Kum Ian Statue is located on the Outer Harbour. 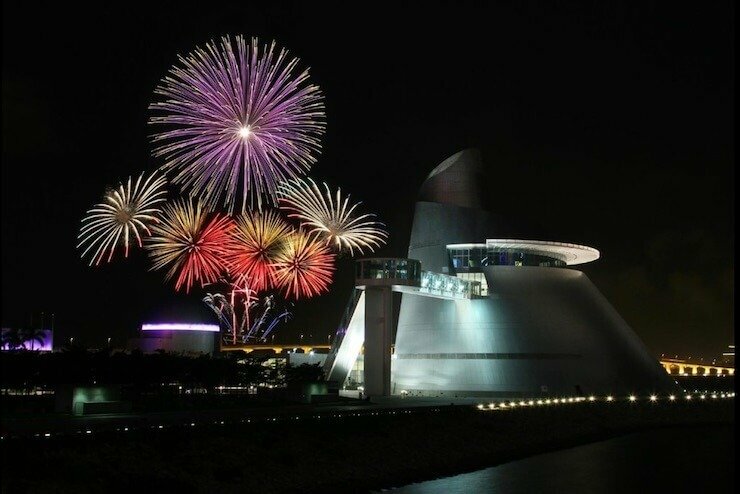 It sits on a man-made island that sticks out 60 meters from the mainland and offers totally unobstructed views of the fireworks. The statue is dedicated to the Goddess of Mercy and is the symbol of the Ecumenical Centre. Kun Iam, or Guan Yin in Mandarin, is a deity embodying love, mercy and compassion. Likewise, the Macau Science Center just a short walk away, with its distinctive I M Pei-designed, asymmetrical, conical structure, sits in a prominent position by the sea. If you have kids, this is a great place to spend a couple of hours checking out the exhibits (all five floors of them) and Planetarium. There is a viewing platform up the long escalator to the top floor. There is even McDonalds here for the kids! The area surrounding the Macau Science Center and the wide promenade that skirts the shoreline is a great vantage point for the fireworks. Just behind the Macau Tower there is Nam Van Lake, a man-made lake with a broad promenade from which to watch the fireworks with nothing in between to obstruct your views. On the east shore of the lake are several hotels, the Wynn Macau, the MGM Macau and the Mandarin Oriental which also enjoy splendid vistas. On the north end, a new leisure center has opened, the "Anim'Arte Nam Van" where you can stroll around and spend a couple of hours during the day and enjoy the cultural performances, handicraft kiosks, delicious fare at the cafe, and of course the fireworks at night. Penha Hill is the third highest hill in Macau and overlooks the harbour, making it a prime spot for the fireworks. This is also where Our Lady of Penha Church is located, with a statue of the Virgin facing the sea. It's a pretty spot and very popular for wedding photography shootings. Also on Penha Hill is the Hotel Riviera Macau, it faces the bay and has fantastic fireworks views. The area around Sai Van Lake is quieter with a beautiful tree-lined promenade and Penha Hill towering above it. 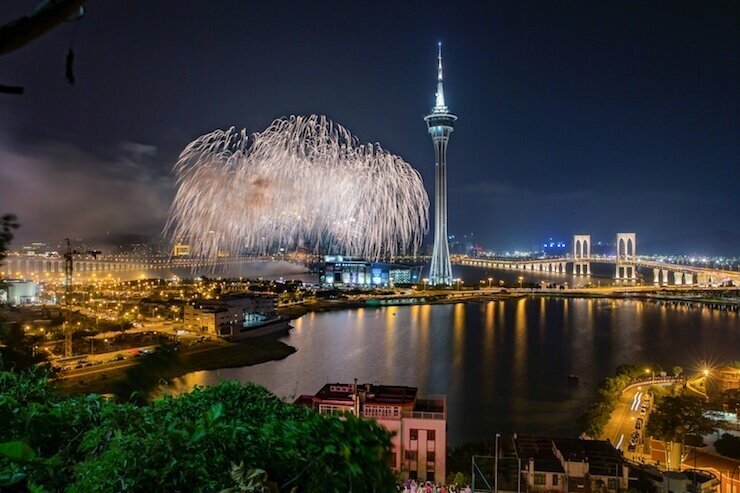 You can watch the fireworks along the Avenida da Republica which skirts the lake on its northwest side and there is nothing obstructing the views of the Harbour but the Macau Tower which makes for a nice focal point. There are a few cafes and restaurants along the Avenida where you can enjoy a bite and the fireworks display: Ali's Curry House, which is one of the best Portuguese restaurants in Macau and Henri's Galley, try the African Chicken! There are three bridges that link the Macau Peninsula to Taipa Island, the Macau-Taipa Bridge is the middle one and the only one where pedestrians are allowed. The bridge is about two-and-a-half kilometers long, and at the middle point it is 35 meters high, the views from here are breathtaking, you have the Macau Tower and the the Sai Van Bridge in sight and beautifully illuminated. It takes a good 15-20 minutes to get to the middle point from either end. Also known as the Governor Nobre de Carvalho Bridge, access to it on foot from the Macau Peninsula side is by the Wynn Macau which is adjacent to the bridge. 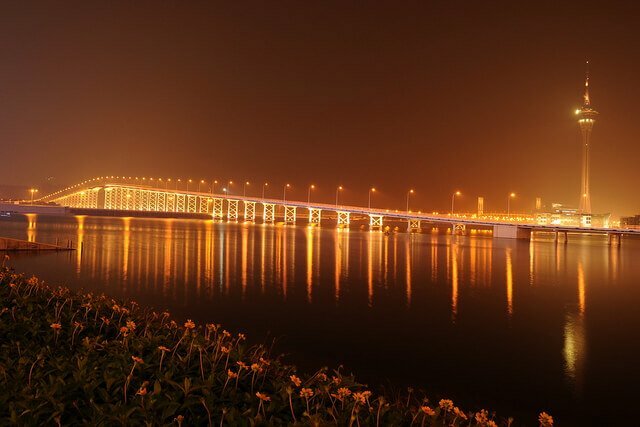 On the Taipa side, the bridge ends on a road that skirts the shoreline and by the Regency Art Hotel and the Altira, both are also fantastic choices for fireworks viewing. The Altira in particular has a phenomenal rooftop bar on the 38th floor. Watching along the shoreline on the Taipa side also gives you unobstructed views, although you are a bit further away from the action. One popular spot is at the end of the Sai Van Bridge where the Leisure Area of Taipa Waterfront Park is. There are jogging and biking trails, kids areas, toilets, but the best part of course are the views. Getting to Macau and back is fast, easy and convenient with the Macau Ferries. Check out our "Macau Day Trip" page for more info on ferries, getting around once in Macau and other practicalities as money matters and passports/visas.